Renewable energy, regenerative energy, and alternative energy are noted for their ability to produce energy which is virtually inexhaustible in the context of the human lifespan, and that is able to regenerate its source relatively quickly. This is what sets them apart from the fossil energy sources that only regenerate over a multimillion-year period. In addition to higher energy efficiency, renewable energy sources represent the most important pillar of sustainable energy politics and changing energy policies. These energy sources include hydropower, wind energy, solar radiation, geothermal, and renewable raw materials. The term “renewable energy” is not to be understood in a strictly physical sense. This is due to the fact that the energy conservation law, states that energy is neither, destroyed nor created, but rather converted into different forms. The sun is vital for the existence of biological life on earth. Energy is an essential component that allows mankind to live. It provides the basis of everyday life and is essential for the growth of the economy. Solar energy uses the energy of the sun, which reaches the earth as electromagnetic radiation, and is perceived by us as heat and light, producing warmth and electricity. The sun is a long-lasting, natural, and renewable energy source. Since the sun’s energy levels have first been measured, the values have remained consistent, which assures the sun as a potential provider for energy with a promising future. Natural gas and petroleum, the former main sources of our energy supply, are limited resources on our planet and are being depleted. Both the continuing of global warming, and the limited resources, such as natural oil on earth, are factors that have caused a rise in awareness and triggered a global re-thinking process. With the growing worldwide financial crisis, the stock market turbulences, cyclical downturns, and certainly the recent events regarding the nuclear disaster in Fukushima (Japan) have reaffirmed the importance of renewable energy. 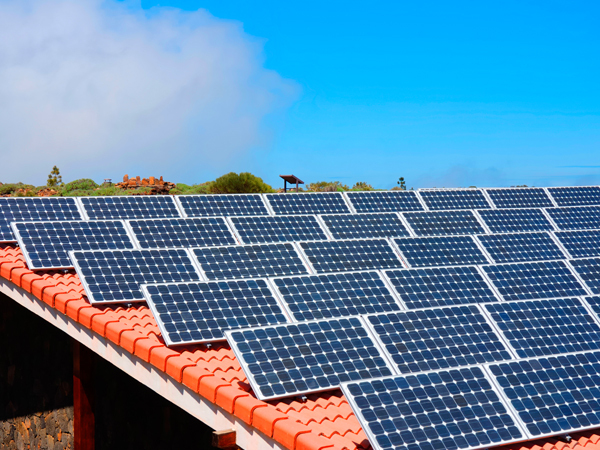 Solar energy is playing a dominant role in the field of renewable energy. With it’s use increasing rapidly, advances in technology are being made that allow for the effective production of energy from sunlight. In fact, solar power is emerging as an economic alternative to fossil energy. With the increasing use and acceptance of solar energy, and the growth of the installed capacities, the production costs will be impacted and will cause a long-term beneficial effect on electricity prices. In a few years private and commercial buildings will be equipped just as commonly with solar electric systems, as they are currently equipped with heating and air conditioning. Each will generate its own power as is needed locally, completely decentralized. The supply networks of energy will convert to related energy networks. In this case, solar panels will generate heat (solar thermal), producing electric power from solar thermal power plants with the help of heat and steam and current electricity by means of solar cells (photovoltaic). Solar energy is renewable energy; its use is encouraged in many countries. To support it displays a positive image for the respective buildings and their owners, additionally solar energy is widely available and an environmentally friendly way to generate power (eg solar power saves fuel imports). Alone in 2009 3.6 million tons of CO2 have been reduced. Even at low sunlight a solar plant is capable to transform light into electricity. Solar systems also have a long life (up to 25 years). Investment in photovoltaic systems (PV systems) is financed by the Renewable Energy Law in Germany, and with similar laws in many other countries, they are rewarded with high returns. Therefore, invest in SOLAR – in your future!